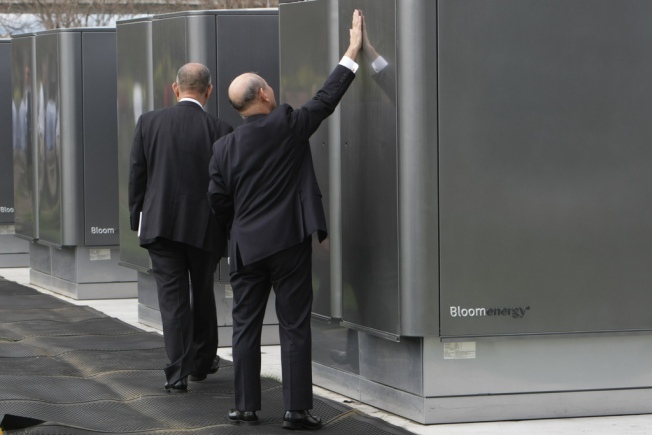 Bloom Energy's fuel cells can turn natural gas into electricity without combustion. Bloom Energy is a young company that makes a big promise: clean, affordable electricity that's off-the-grid. Their "Bloom Boxes" use cutting edge fuel-cell technology to turn natural gas into electricity on-site, like a mini-power station. Big companies like Google and Walmart have been using the tech to power select stores and data-centers. In the Bay Area, AC Transit uses Bloom to power their facilities. But the NBC Bay Area Investigative Unit requested performance data for AC Transit's Bloom system and found that the fuel cells only performed as advertised for a short period. After three months, the efficiency dropped steadily. “If the thing emits more carbon dioxide than they say it does, then this is greenwashing,” said Lindsay Leveen, a former Genentech scientist and an outspoken critic of Bloom. Leveen converted the efficiency numbers AC Transit provided and found that over 22 months of operation, the fuel cells emitted 825.31 lbs CO2/MWh, an increase of 6.8% over the claimed performance of 773 lbs CO2/MWh. It's a small change, but one that brings it much closer to its main competition, the electric grid. The same effect was observed in Delaware, where Bloom technology powered 22,000 homes in the state. Over 24 months, the average emission rate was 823 lbs CO2/MWh. Bloom wouldn't give an interview about these numbers. But after the NBC Bay Area investigation, they quietly changed them anyway. On their website, they switched out their old data sheet for this new one. In the new data sheet, the original emissions claim of 773 lbs CO2/MWh is nowhere to be seen. Instead they give a range: 735-849 lbs CO2/MWh. Although the original data sheet was factually correct, in order to avoid any potential misinterpretation, the data sheet was updated from an instantaneous efficiency and emission rate to include a range of efficiencies and emission rates over time. The original efficiency and emission rates were within the updated range. Bloom is still cleaner than natural gas power plants in terms of CO2 emissions. And it won't emit other polutants like nitrous oxides. But those savings still come at a cost. The state provides rebates to customers who purchase emerging energy tech. That means that California taxpayers susbsidize the cost of Bloom fuel cells which cost about $800,000. At the time of the original NBC Bay Area investigation, Bloom users had received more of these subsidies than other company: $230,749,470.00 in total. This article is part of FrameShift, NBC Bay Area’s Investigative Blog. FrameShift writes on investigative reporting in California and expands the coverage of the NBC Bay Area Investigative Unit.